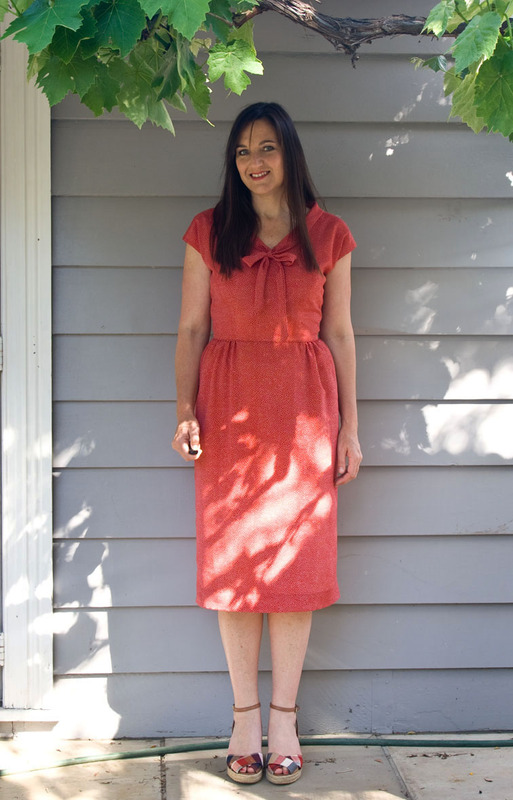 Finished – Red Spot Dress! I’ve officially finished the Red Spot Dress that has been consuming my spare time this last week! I’m not that happy with the way the roll collar is sitting, despite doing it about three times – and then it changes whenever you tie the bow! If I was the designer, I’d separate the collar and bow to avoid this problem. Then you could exchange the bow with something else when it takes your fancy. This shot shows the skirt gathers better – they’re not too unflattering despite the fact I have quite a large muffin high hip, in fact they hide it rather well! After all that work I’m not sure I’ll wear this dress much – I can’t pinpoint what I don’t like about it, but it just doesn’t feel right. Maybe it is the prissy bow neckline, or maybe I don’t have the right shoes, or maybe it is just that fabric that has been telling me to leave it alone since day one. I’ll hang it up and see how I feel after a week of no Red Spots! 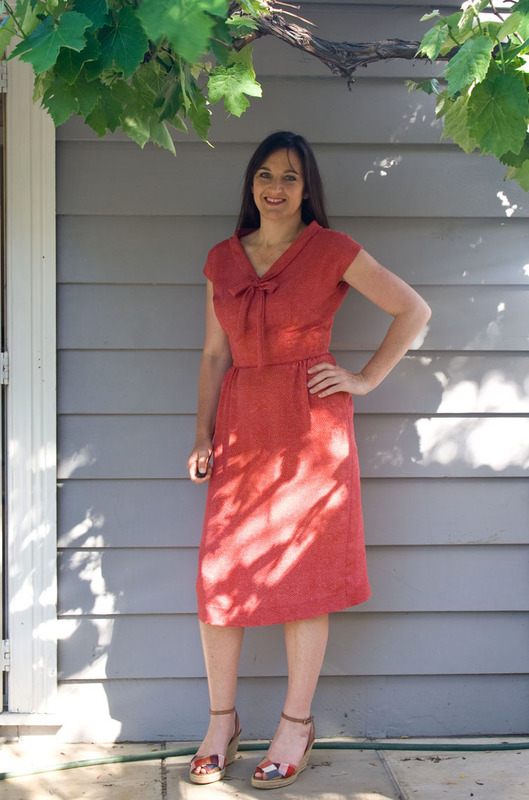 And just in case you haven’t been following the Red Spot Dress story, here are the links to previous posts! Dream Job: A Sewing Lounge? Just beautiful! I love the style on you and your sewing is always exceptional. You will enjoy this one for a long time to come. Shoes. Any excuse to buy new shoes, right? Although I really like your plaid ones. I think it's lovely. But I'm always a fan of spots. Love that piped waistline. Such a nice finish. Gorgeous! It is so inspiring to follow your work in detail. As always this is absolute perfection, especially the details on the inside. I love it – the piping is my favourite detail, I think! Bravo! That dress is gorgeous, but I must admit, I can't take my eyes off your shoes! I love them! The dress is cute, particularly the bow detail. I do hope you change your mind and enjoy wearing this dress, especially after the effort of doing the bodice twice. I never feel comfortable in vintage styles, but other people look so good in them…perhaps you need to try different accessories or layers or something to get it to feel like you. The red is so pretty under the vine leaves. Oh, I love it to bits! Wow, what an amazing improvement—it looks great! And I wouldn't notice the collar as a problem at all. It reminds me of the new Colette blouse pattern, actually. And you're right, the waist gathers are really nicely placed. Sometimes stuff just doesn't grab us, even when it fits right. Maybe it'll grow on you (time in the magic closet?) or not… that's the trouble with not being able to try something on before you make it. It's beautifully made – I love all the details. I hope you fall back in love with this dress as it's delicious. Beautiful, Sherry! Love the details. This has nothing to do with red polka dots. I just wanted to profusely thank you for your “easy” swayback adjustment (the one where you just pivot at the outside shoulder). It works! It's so simple! The wrinkles are gone! Thank you! I hope you'll decide you like it after a bit, maybe you just spent too long working on it to love it straight away. I think it looks fantastic and I really like it with the shoes you are wearing too. You're not sure that you like it?!!! It looks absolutely divine – I really love it – and (as with all your garments) it looks superbly made. I do hope that you learn to love it because it really is a lovely, lovely dress! OOOOOH! This is the most beautiful dress I've seen in a long while! Love the fabric, the collar, the bow, the piping, even that ribbon on the inside. What can I say… Great job!! I'm also wondering if the fabric you used is the same as the one of my “lady in red” dress… That would be so weird, since we live in opposite sides of the world! I'm sorry that you're not thrilled with it – I think it looks fantastic! Perhaps you need to send it to time out until you get over your annoyance at it! Maybe by then you'll be back to liking it. Wow, such persistence and what a big difference. 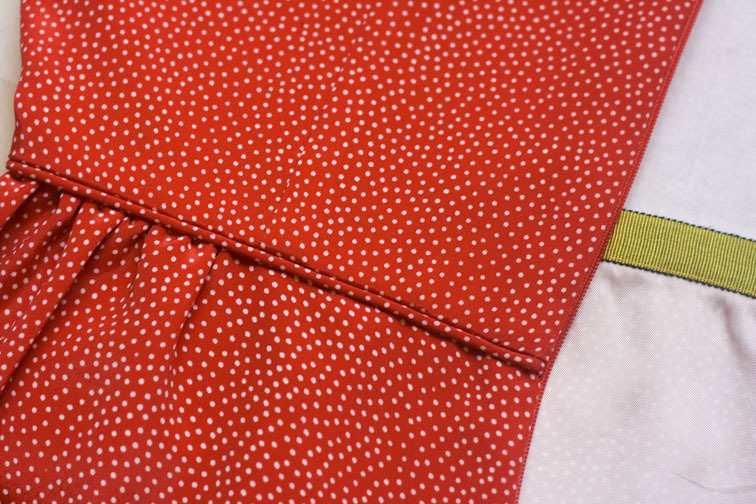 I love the piped waistline and am curious how you sewed the ribbon into the inside–really lovely finish. However I totally understand the hours of hard work and then the not-so-sure-I-really-like-this feeling. 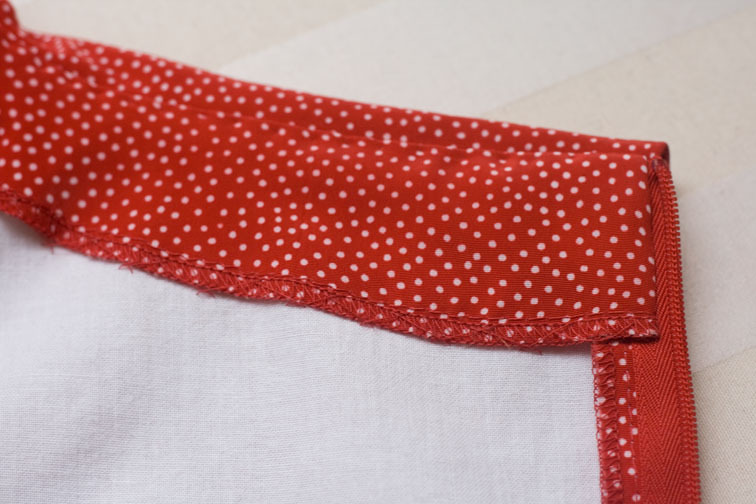 Sometimes sewing feels like it's hard to see the forest through the trees (or polka dots). Like Tanit said, one of the problems of not getting to try it on before buying–it never gets to really say “yes!” to you. I do think this silhouette and proportions are really perfect for your figure and height–gorgeous! Lovely dress. Polka dots are one of my favorites. 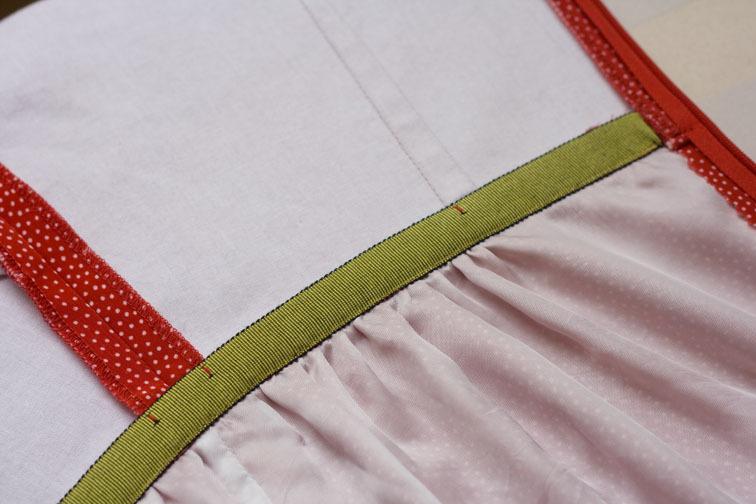 You are truly a superior seamstress – your attention to detail is impeccable. Your dress is beautiful. Try the dress with a belt on it in a contrasting white or black. 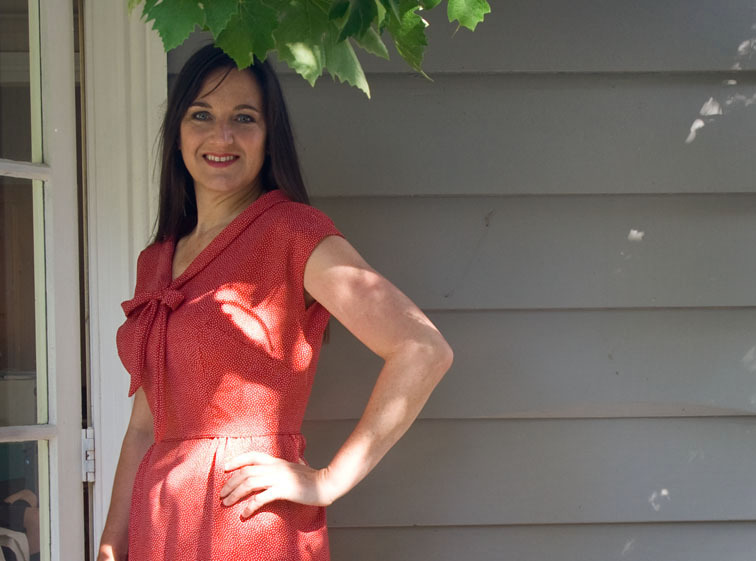 What a vast improvement – I bet once you are a little further removed from all the frustrations, this dress will fill a niche in your wardrobe. I'm always so impressed with the insides of your garments. Beautiful! I really love your dress and I think it looks beautiful – beautifully made and fitted perfectly to you. I've only just discovered your blog and have printed off so many tips already. Thank you! Hurray! I think that when you come across this on the rack, weeks or months from now, you'll wonder what was bothering you so about it. Distance yourself from it with some fun project, and leave it to pout in a corner until it has decided to behave itself and come back to polite society. It looks great, but sometimes things are not meant to be. Give it some time, and maybe it will grow on you. I often feel disappointed in a garment, only to have that disappointment disappear after time. Good Luck! The dress has such a lovely feminine shape and so the overall look is very sweet. You look great in it, but perhaps “sweet” is not your aesthetic? That would explain why you don't feel “at home” in it. The magic wardrobe (put it away until you've forgotten the pain) can work wonders in these instances. This dress looks lovely on you and has so many nice features. The piped waistline is very nice and I do like the bow. Maybe you don't feel comfortable in it because it doesn't conform to your personal style. This is always a tough one. What you might admire on others doesn't necessarily feel right on you. I'm sure you'll find the right place and time to wear it. I love this dress it's just beautiful. I especially love the piped waistline it's gorgeous I have never seen that before. It's pretty, Sherry & looks great on you. My trials & tribal with darts are on red fabric with white dots, too. But it's making me see spots! I really love the dress (and the shoes!) and I love the piping on the waist. I think it needs to be a touch shorter. But really that's a small thing – I think it is beautiful – you do such nice work. I hope you wear it – wish I was your size! It looks lovely on you. The construction details are so precise. How inspiring. I hope you do like it after all this work. It looks great. The inside is beautifully finished. Sometimes I find it hard to like something I've sewn that's caused me lots of frustration so maybe that's why you feel it isn't quite right. lovely! great details and professional finish on the inside. i would like to knock this pattern off soon, its been in my to-do list for for long now! How nice is this dress!! Now you've underlined it, it looks perfect. I'm loving the piped waistline too. Maybe you don't like it because of the problems it caused you. Give it time I'm sure you will come around. Your attention to detail is amazing. I think the dress is fantastic and so beautifully made. You should wear it. Hurray! You conquered the dress! I think it's really pretty and after all that work you should wear it proudly. But that happens to me a lot, especially when something was giving me a really hard time when sewing I don't feel like wearing it, because it makes me think of all the issues I had with it. But put it away for a while. After a little break you might forget all the problems and get a new relationship to the dress. This red is really your color. You look so alive and pretty in the photo. I know you are seeing red in your nightmares, but don't punish the dress. It makes you look exceptional. It looks wonderful!! I just love the neck-bow, the print and the colour are so gorgeous, and the underlining made all the difference, and as usual you detail shots show the superb workmanship I've always admired about your creations; something to aspire to! My own opinion; I agree the shoes are not right. Some plain high-heeled pumps with no ankle straps would showcase the dress really beautifully. Ankle straps are not so good with as skirt of that length. A good excuse to go shopping?! Very pretty! 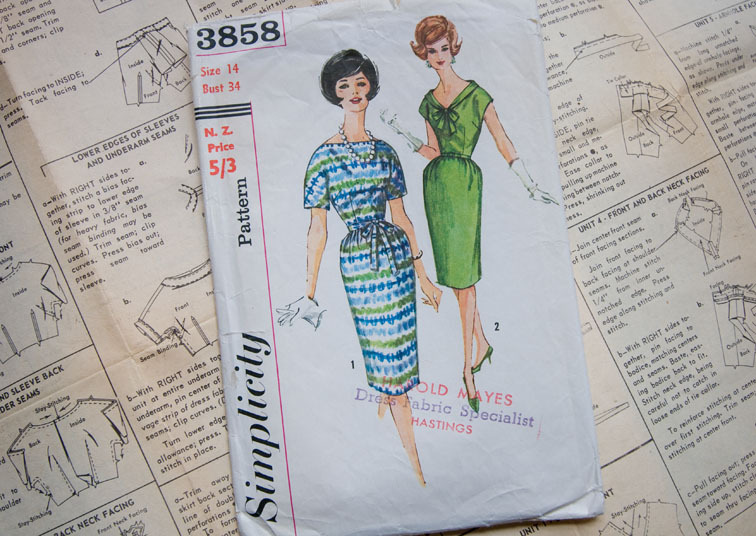 You're work is lovely to look at – I hope you get to know this dress better – it deserves that! It turned out so well! Going back and doing all the extra work certainly paid off. It's perfect! Sherry, You've outdone yourself. Love the small details, especially the piped waistine. A cracking dress and suits you to a tee. I love this dress. It looks wonderful. The red dots are sweet and the bow is so nice. I think you are right about maybe being able to switch out the bow. I was thinking a blue bow with this red dot would be very striking. I really hope to have at least a third of your talent some day. The lining is very clean and the total dress is so professional. Very nice! !